SAVANNAH, Ga., Feb. 07 /CSRwire/ - The Georgia Historical Society (GHS) is pleased to announce that the collection of the late Ray C. Anderson, the visionary industrialist, environmentalist, and founder of Interface, Inc., is now available for research at the GHS Research Center in Savannah and online through the GHS online finding aids. The collection was donated to GHS by the Ray C. Anderson Foundation and Interface, Inc. in late 2015. Ray C. Anderson founded Interface, Inc. in 1973 with a vision to provide flexible floor coverings for modern office buildings. By 1983 the company was posting sales of $11 million annually, and following the 1987 acquisition of Heuga Holdings B.V. it became the undisputed world leader in carpet tile manufacturing. The Ray C. Anderson Papers (MS 2603) are available at the GHS Research Center in Savannah. The online finding aid can be found at http://ghs.galileo.usg.edu/ghs/view?docId=ead/MS%202603-ead.xml. Consisting of over 200 boxes and covering the years 1947 to 2012, the collection contains biographical materials, business records, correspondence, organizational records, photographs, presentations, speeches, writings, travel files, books, journals, and over 200 artifacts documenting Anderson’s life. It includes correspondence with colleagues and significant environmental and political figures such as Paul Hawken, Jimmy Carter, and Bill Clinton. 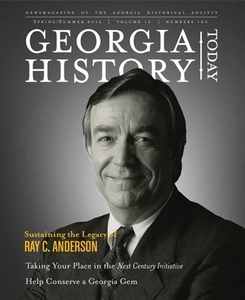 Ray Anderson’s papers were donated to the Georgia Historical Society in 2015. Accompanying the donation was a gift from the Ray C. Anderson Foundation to process and endow the collection.